Chocolate banana bread – Rich semi-sweet chocolate swirled into a moist and delicious banana bread with a touch of cinnamon to bring out all the wonderful flavors. I rarely make banana treats. No matter how many bananas I buy, my monkey family ends up eating them while still yellow leaving me with none to have around long enough for them to become brown, soft and sweet. To my surprise a couple of weeks ago I saw at my local grocery store bananas with so many brown spots on them they were just begging to be used in baking. It was my lucky day for sure! I picked just enough to bake a banana bread and the banana sheet cake I already shared the recipe with you. The banana bread turned out so good I’ve already baked it three times in two weeks! What I love most about this bread is that it doesn’t add cocoa powder for the chocolate swirl, but actually chocolate, melted and blended with a little bit of batter. 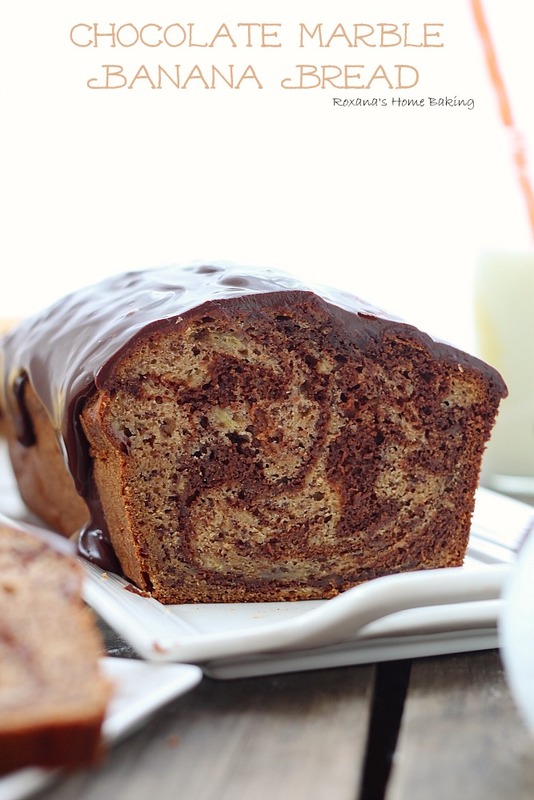 You still get all the wonderful flavors of a moist and delicious banana bread combined with a rich taste of chocolate. A little bit of cinnamon is added, just a touch, but it makes the sweet banana flavor to stand out. Another thing, slightly different, when making this bread is that you start by creaming the butter and sugar for a good 5 minutes until fluffy, giving the bread a light texture, towards a pound cake. Once baked the bread crust is dark and brown and the top has a crack or two. Let it sit for a couple of hours to cool on a wire rack and the top will soften the longer it sits. I love that this bread it gets better with the age, not that it lasts too long. Just a couple of days. To give it a personal touch I melted some chocolate in hot heavy cream and poured it over the cooled banana bread. Ah-mazing!!!! Heat the oven to 350F. Grease a 9X5" bread pan and set aside. In a mixing bowl add the butter and sugar. On low speed, with the paddle attachment on, mix for about 5 minutes until creamy and slightly fluffy. Meanwhile melt the chocolate in a heatproof bowl. Set aside to cool a little. 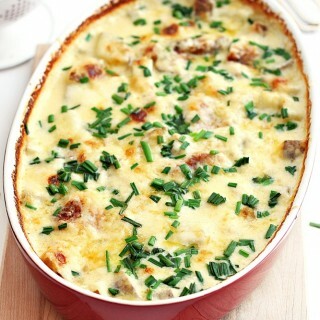 Add the eggs, mashed bananas and Greek yogurt and mix until combined. Slowly, on low speed, add the flour, baking soda, salt and cinnamon. 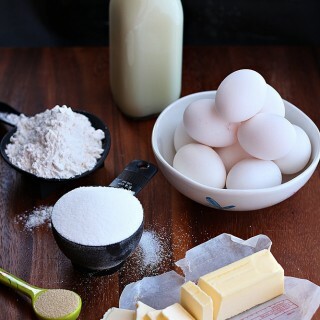 Stop the mixer when all the flour is incorporated. Do not overmix!! Take 1 cup of the batter out and mix it with the melted chocolate. Pour the remaining batter into the greased bread pan. Pour the chocolate mixture over the banana batter and, with a fork, make a couple of swirls. Bake the banana bread in preheated oven for 1 hour and 20 minutes or until a toothpick comes out clean. Leave to cool for about 5 minutes in the pan before removing. Cool completely on a wire rack. When cooled, make the ganache. In a heatproof bowl, place the chocolate chips and heavy cream and microwave for about 1 minute. Stir to combine to make a smooth, rich, silky chocolate ganache. Pour over the cooled banana bread and spread with a small spatula or the back of a teaspoon. Let the ganache set for half an hour before slicing the bread. 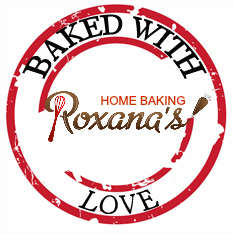 Starting today bake your own bread takes a new name : Baked with Love! 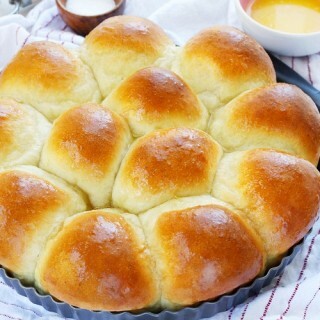 I have been thinking lately and since I LOVE baking anything, not just bread but I felt like some of you were discriminated for not being able to link your beautiful creations. Well, now you can!!! Everything that’s baked with love, in your own kitchen can be linked. I can’t wait to see your amazing goodies!!! And to make things sort of organized, here are some simple rules. 1.) Bake something with love and blog about it. Anything, no matter the complexity, baked from scratch in your own kitchen. Or it could be an informative post, a tutorial or how-to post. Anything that will inspire us to bake more at home. If you don’t have a blog and you’d like to participate, please email me a photo of your bread and the recipe and I will create a page for it. 2.) Include a link back to this post letting your readers know about this monthly event. Uploading the logo in your post or sidebar would be highly appreciated. 3.) Please link only posts from the current month. You can link as many as you want! At the end of each month I’ll share a roundup post of up to 10-15 posts that caught my eye during the current month. Roxana, you've elevated banana bread to a whole new level. My daughter is going to squeal when she sees this. It looks like this gorgeous loaf will be springing from our oven very soon! definitley doing this tonight.. my bananas are so dark that this will be perfect! Ahhhh that chocolate on top is killer! This banana bread sounds fab! Woah! This looks fabulous, Roxana! Love the marble and the glaze! 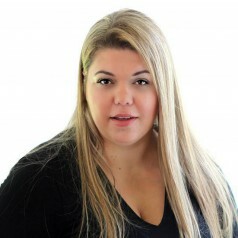 Oh Roxana!!! What an incredible banana bread...love everything about it! Thanks for a wonderful recipe! Stunning. Your photos are fantastic too! This is most drool-worthy, wow the photos are amazing! I love the marbling in your bread and that ganache topping looks glorious! OH MY WORD! 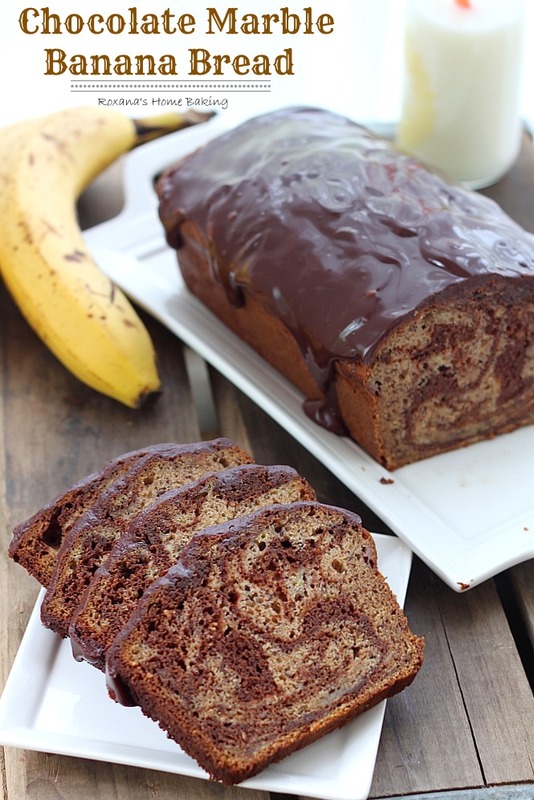 First of all, the chocolate glaze, I couldn't think of a better way to top a banana bread. Second of all, I love that this uses melted chocolate instead of cocoa powder. YUM! 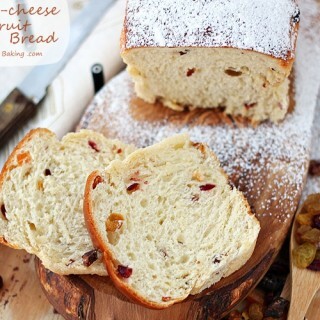 This is SUCH a gorgeous bread, Roxana! 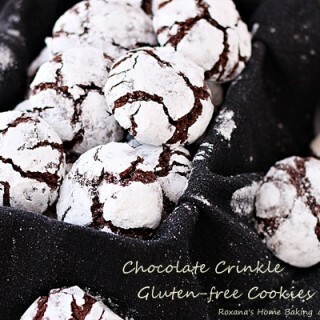 I love that it's dripping with chocolate - so decadent and delicious! Thanks for sharing. This is just gorgeous!! I love that glaze over the top! The glaze on it looks so tempting! I love that chocolate is used instead of cocoa powder to make swirls! Love the new name of your monthly roundup! Will definitely submit something I bake! 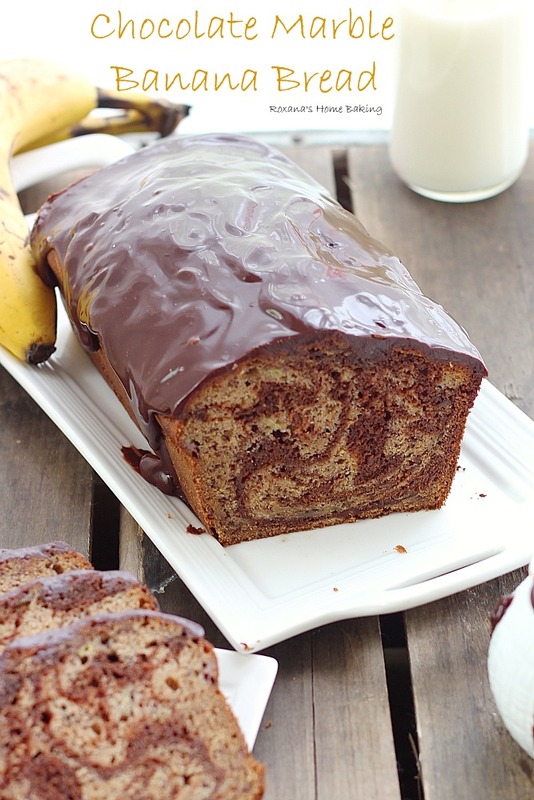 I love the idea of chocolate and banana marble bread, this looks so good! I really love the look of that glaze too! Roxy you should open up a bakery...for real! 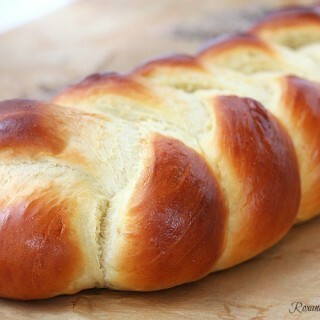 This bread is so delicious looking, and moist...oh my mouth is drooling! 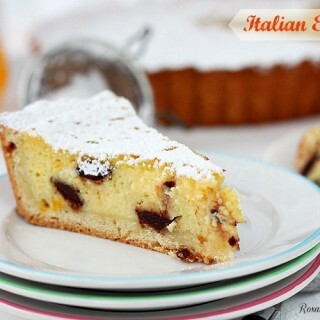 Absolutely mouthwatering pictures with fantastic recipe! Haha the "monkey family" made me smile. Mine used to be monkey family too but they turned into something else! 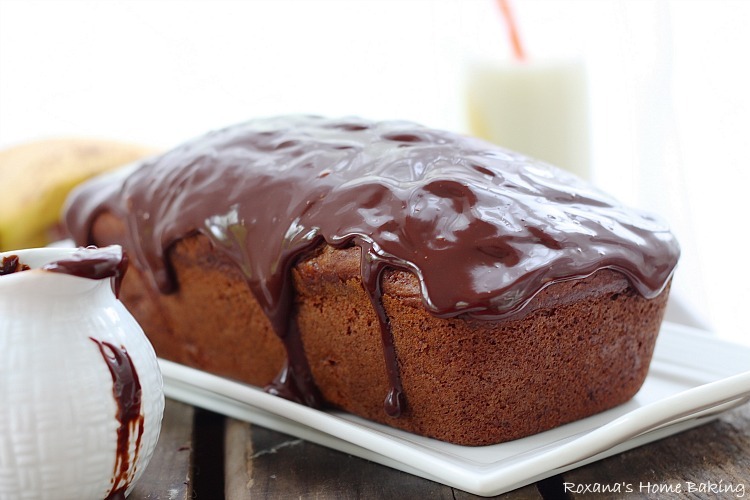 I haven't tried banana bread with ganache. I need to try that! This is an incredible loaf of bread Roxanna! Love the chocolate glaze! I love the top chocolate layer, it looks so delicious. I make banana bread quite often, it's easy and I like the taste. In your recipe I like addition of cinnamon, I have to try it. This is a great idea Roxana, I've linked up my recipe for lemon and vanilla bean swirls. I like that the swirl running through your banana bread is made from melted chocolate instead of cocoa powder, I can imagine it taste's delicious. Roxana, this bread looks wonderful. That chocolate glaze is calling my name. Yum! What a treat this turned out to be ! Heavy cream + melted chocolate + banana bread! Yes, please! 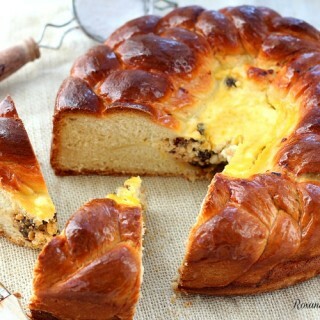 I absolutely love that you topped that gorgeous bread with a chocolate ganache!!!! Swoon!!! Roxanna; for this receipe if I wanted to make it using individual loaf pans, how many would you believe this recipe would make? I have 6 pans as well as mini bundt pans and would love to try it this way. :) thanks! Thank you for sharing. I made it this morning for my parent in laws. They love it and I had a little bit to eat and it was amazing.